Until recently, Asperger's Son2 had no interests that didn't involve a computer or a games console. He used to love Lego, but that faded into the background the older he became. He used to spend hours reading and memorising Horrible Science magazines, but that too, petered out. He spends far too much time playing Xbox but at least half the time he's playing Xbox Live, talking to his school friends as they play together, remotely. Over the summer however, he became interested in wargaming. 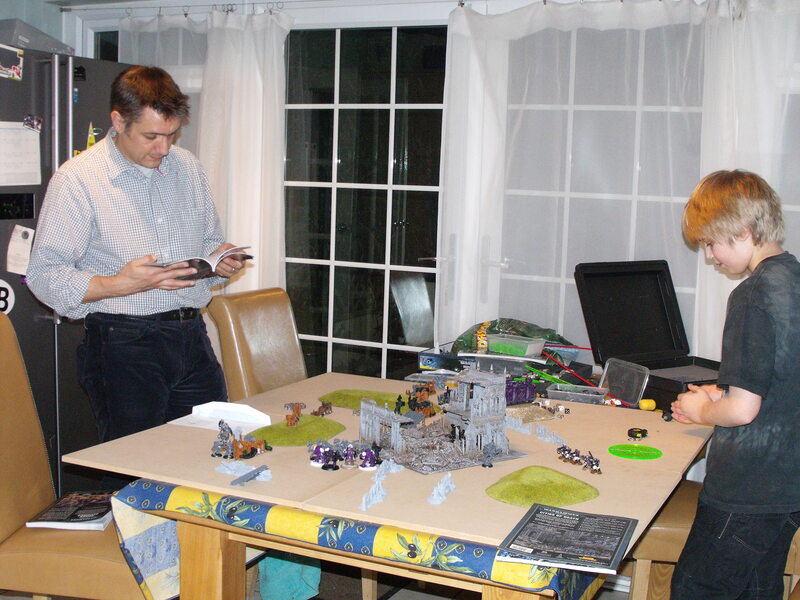 Not computerised, but Games Workshop wargaming, painting figures and playing board games with them. This was a revelation and we've been quick to support him. This entails spending vast amounts of money on Orks (for my husband to play with him) and Space Marines (for him) as well as Codex books, paints and carry boxes. Most Sundays I take him to Games Workshop where he paints alongside a few other boys, instructed by the fantastic guys who run the store. These guys are amazing - always on hand to help in a low key, let-them-get-on-with-it sort of way. They're not teachers but my son is learning valuable skills both social and practical. Son2 has dyspraxia and has always found art, painting and writing incredibly difficult. 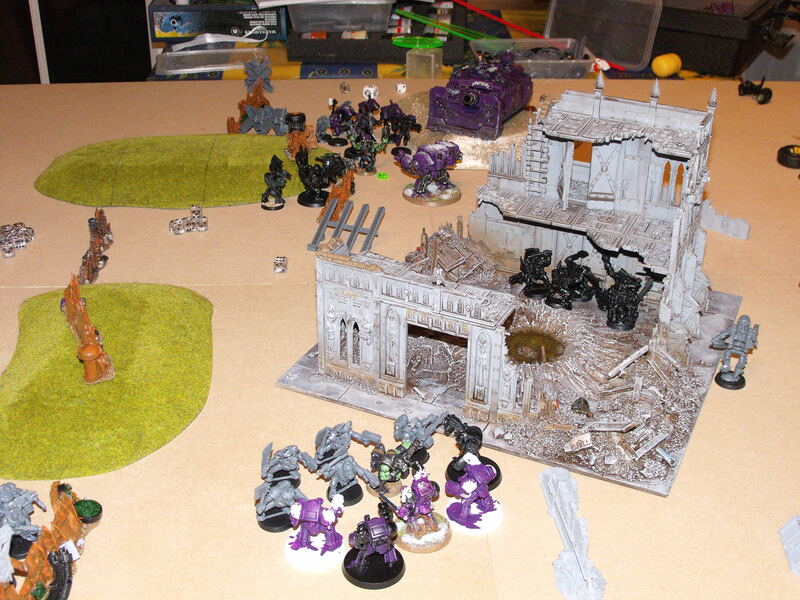 But the care and detail he puts into painting his Space Marines is a joy to see. I'm certain it's improving his fine motor skills which should improve his school artwork. 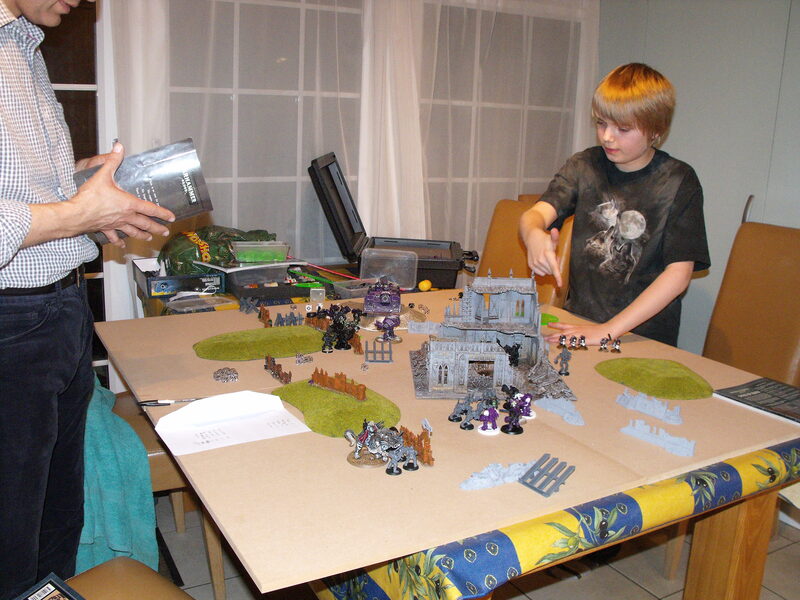 He's also learning from Nick, the GW guy, more about rules and how to play the games. Strangely, there's always a little something Son2 decides he needs to buy at the end of the session as well. It's not wholly surprising that he's picked a hobby that involves collecting and being immersed in a scenario - but if it's improving his communication skills with real people, I'm all for it. So even though on most Sundays, I can be found wasting two hours wandering around the adjoining shopping centre or sitting in Starbucks on my iPad as I wait for his session to finish, it's worth it - just to see him interacting with something that doesn't need plugging in. Best of all, he's enjoying himself and it's a hobby my husband can enjoy with him as my husband sculpts his own figures - not fantasy but World War II. This game in the pictures lasted two days and Son2 thrashed his Dad, much to his delight. What's your special needs child's favourite pastime? Benjy loves this too and although it is hellishly expensive has got a good collcection going. I like your board that he is building up his scene on – a good idea if you have space. Benjy has also started building tanks – a LOT cheaper – Tamiya do a great range. Hobbycraft stock a wide range. The Guys at Games Workshop are so patient and knowledgeable, Rhys my husband used to work as a manager for GW and now has a Games Workshop premuim store in Aldershot called the Games Shop. He runs an under 16’s Wargaming session on a Friday from 6pm called The Grotz. The kids love it as they have their own war room with everything from scenary to paints and the two other staff love sharing their passion. The other good thing is that the war room is open every day and dads and sons often book the room for the day so if Aldershot is closer come along. Games Workshop products are really well made, creative, and of course there is an element of using social skills and reading as well as turn taking and strategising. Me, I love the name of some the paints that Rhys’s stocks such as Ork Flesh etc -maybe beige to me but no its Ork Flesh or some other funny name colour!! !